The No.1 feature request we got this year is the ability to record audio instead of video so we set out to deliver just that, hopefully by the end of the year. We started by researching just what kind of audio options are available with HTML5’s new promise based getUserMedia(), the almighty gateway to accessing the user’s webcam and microphone. We were well aware of the audio recording capabilities in our legacy Flash based recorder. Ever since doing our first video recorder back in the 2010s we were able to record single channel audio using NellyMoser’s ASAO codec at up to 44kHz and with Speex at 16kHz using various bitrates. 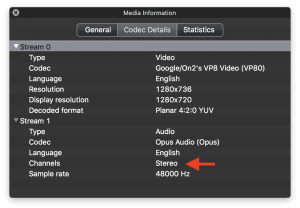 We were not so sure about HTML5’s audio recording capabilities in Chrome & Firefox when using getUserMedia() and the Media Recorder API as we only saw Opus audio at 48kHz (and Vorbis @ 44.1 kHz in Firefox 47 and older) while developing both our 1st (WebRTC based) and 2nd generation HTML5 video recorder (Media Recorder API based). encoding sound in Chrome, Firefox and Safari 11. Opus is a great audio codec. It’s open, royalty free and so flexible it can [encode (fullband) music better than the AAC encoder in iTunes](http://listening-test.coresv.net/results.htm) but also encode narrowband voice with a [latency that’s lower than any other codec’s](https://opus-codec.org/comparison/#bitratelatency-comparison). Tsahi Levent Levi has a great [blog post on why Opus is so great](https://bloggeek.me/single-voice-codec-webrtc/). The Media Capture and Streams spec governs the cross browser audio options that should be implemented by all browsers and, in it’s latest Candidate Recommendation incarnation, it defines quite a few audio constraints. channelCount: specifies the number of channels to use with 1 being mono, 2 being stereo. It works with some webcams and laptops with dual mics. A surprisingly comprehensive list – at least when comparing with the options Flash gave us – but just as surprising most of them are not widely supported by browsers. Understandably some of them are new (autoGainControl and noiseSuppression) but others (sampleRate, sampleSize, and echoCancellation) were added to the spec as early as February 2014. Adding support for these constraints would open up Opus’ flexibility to developers. I’ve used MediaStreamTrack.getSettings() to log to console the settings supported by each browser as MediaDevices.getSupportedConstraints() returns too many false positives . I also tested the latest versions of Chrome, Firefox and Safari to make sure changing the constraints has an effect. Use this code pen to check future browser support (does not work in Safari because Safari does not allow getUserMedia() in cross origin iframes). The channel separation was very clear with the Logitech C925e where the mics are widely spaced apart as opposed to MacBook PRO’s 3 microphones which are closely grouped together on the right side of the keyboard. A value of 0, the default, tells getUserMedia() to capture all of the available, supported, channels. Chrome 62 records just mono audio and setting the channelCount constraint (https://developer.mozilla.org/en-US/docs/Web/API/MediaDevices/getSupportedConstraints lists it as supported) to 2 has no effect. There’s an open issue requesting & tracking channelCount, sampleRate and sampleSize implementations in Chrome. UPDATE: Chrome 63 has implemented stereo audio recording. The echoCancellation constraint works by default on Chrome, Firefox(supported since Firefox 46) and Safari 11. It’s especially noticeable when recording videos through this unmuted MediaRecorderAPI demo. It’s very aggressive on Firefox, much more than Chrome. Chrome definitely applies noise removal even if it does not support the constraint. Safari 11 does not support noise suppression at this time. After turning it on it clearly lowered the volume when (almost) screaming into the mic. constraint. 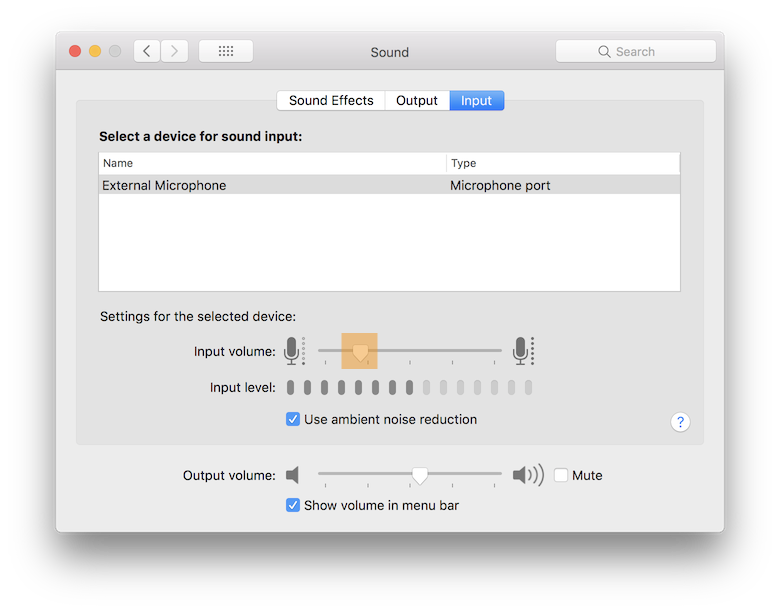 When testing on macOS the input level notch moved to the left as I moved the microphone towards the sound source (but not when echoCancellation was set to false). The above constraint will result in an OverconstrainedError if the device does not have a dual mic webcam. For more details, check out common getUserMedia errors.